Black Limbsaver Protective Shooting Pad. 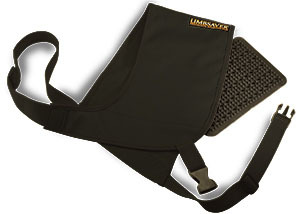 Limbsaver’s new shooting pad is lightweight, extremely flexible and comfortable. If you pop it on over a regular shirt, it feels like you are wearing nothing extra at all. Slip on a light jacket and it neither looks nor feels like you are wearing anything out of the ordinary. The shoulder pad is one size fits all, comes in green (#90101) or black (#90102--we tested the black version) and has a Velcro pocket that retains a thin (about 1/8 inch thick), rectangular Limbsaver pad, made in the USA from their “NAVCOM III” material. The section of Navcom material is covered with little nubs that Limbsaver calls their “break-away” technology. I will confess to not knowing what breakaway technology is, but this is the same type of pad that has proven itself effective in the Limbsaver line of hunting and shooting jackets and shirts. Depending on if you read the part of the Limbsaver site that says “up to 30% recoil reduction” for the green version or “up to 50% recoil reduction” for the black version, you may not know what to expect. The packaging that came with ours says, “50% recoil reduction.” Their clothing claims the up to 30% for essentially the same product. I don’t much care, as long as it works, but it would be nice if the Limbsaver ad department at least got their numbers straight. Here is how we evaluated it. We took a stock Benelli SuperNova 12 gauge pump gun and fired 12 rounds of 1-1/8 ounce, 1235 fps loads without the pad. We repeated the same sequence with the pad. Next, our shooters fired 12 rounds of 2-3/4 inch, 1-1/2 ounce magnum shells without the pad and finally it was rinse and repeat with the pad. The verdict? It works and works well. With the pad on, we could feel essentially nothing at all with the 1-1/8 oz. loads. It was a bang and a broken clay with no noticeable pain. The 1-1/2 oz. loads with the pad were as comfortable to shoot, or even a bit more comfortable to shoot, than the 1-1/8 oz. loads were sans pad, which is to say quite pleasant. Rather than feeling skin pressure in one place, it was more of a “blanket” of a light push with the heavier loads. This extra shooting comfort comes despite the “advanced” SuperNova ComforTech stock and recoil pad. The factory Benelli pad may not be the best, but it is far from the worst recoil pad attempt out there, yet the Limbsaver shoulder pad made an obvious, substantial, unanimous increase in shooting comfort for us. We liked it for what it is, but we ended up liking the Limbsaver shoulder pad even more for what it isn’t. It isn't heavy, it isn’t bulky, it doesn’t get in the way and it did not change our stock weld or sight picture. It is easy to throw in the range bag and it works with all shoulder-fired rifles and shotguns. The Navcom insert is securely held in place and does not shift, squirm, bunch up or move around. It’s good product; the lightest, thinnest and most comfortable recoil pad of its kind to wear that we have ever used. It goes for about $40 direct from Limbsaver, or you can buy one from your local dealer. I am delighted to be able to recommend it.